June 04, 2005, L. G. Crabo. 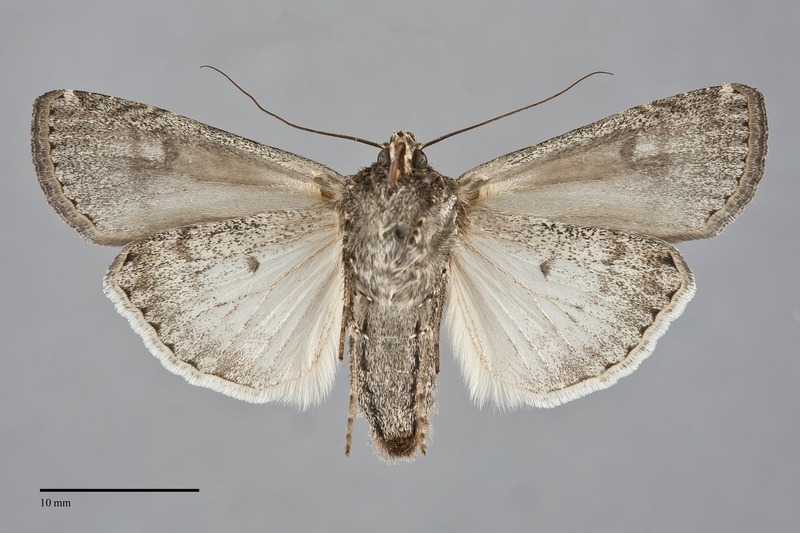 Euxoa simona is a fairly large Euxoa (FW length 17–22 mm) with a mottled and powdery gray-brown forewing and a busy pattern of lines and spots that flies from the Cascade summit eastward during late spring through the summer. The forewing is gray-brown, sometimes warmer coppery tan, heavily powdered with dark scales. The cell is darker brown, and the base and subterminal area tend to be lighter and grayer. The terminal area is dark gray. The basal and antemedial lines are dark gray, double filled with the ground color, toothed on the veins and oriented nearly perpendicular to the wing. The median line is gray, diffuse and faint. The postmedial line is double with slightly scalloped dark gray inner component and a smoother and lighter outer one, sharply drawn toward the base on the costa, bluntly curved around the reniform spot, angled and slightly concave toward the base below the level of the cell. The subterminal line is tan, often yellowish, slightly irregular with an offset below the apex and a weak W-mark on the mid-wing. It is preceded by a dark gray, less often brown-gray, shade on the costa and below the level of the cell, often darker or formed into weak chevrons on the mid-wing. The terminal line is a series of spots or triangles. The fringe is similar to the terminal area. The orbicular and reniform spots are outlined in thin dark gray outer and light gray-tan to slightly yellowish inner lines. The orbicular post is round or oval, filled with powdery gray, sometimes contrasting dark. The reniform spot is strongly kidney-shaped, moderately large, filled with similar filling as the orbicular spot and a dark gray spot at the lower end. The claviform spot is small to moderate-sized, thin, gray to black, variable in darkness from nearly absent to prominent. The hindwing is pale gray with an ill-defined dark gray marginal band on the outer third in both sexes, with dark discal spot, veins, and terminal line. The hindwing fringe is white with a gray base. The head and thorax are powdery grayish tan to dark gray-brown with a thin dark line across the mid-collar. The male antenna is bipectinate, appearing broad at the base and tapering over the lateral half. A frontal tubercle is present. Euxoa simona is a member of the subgenus Pleonectopoda which is characterized by a twist or coil near the base of the male vesica. This species can usually be identified by its mottled pattern and large size for the genus. It is most similar in color and pattern to Euxoa pleuritica but can almost be sorted from it by size (FW length of E. pleuritica <18 mm). 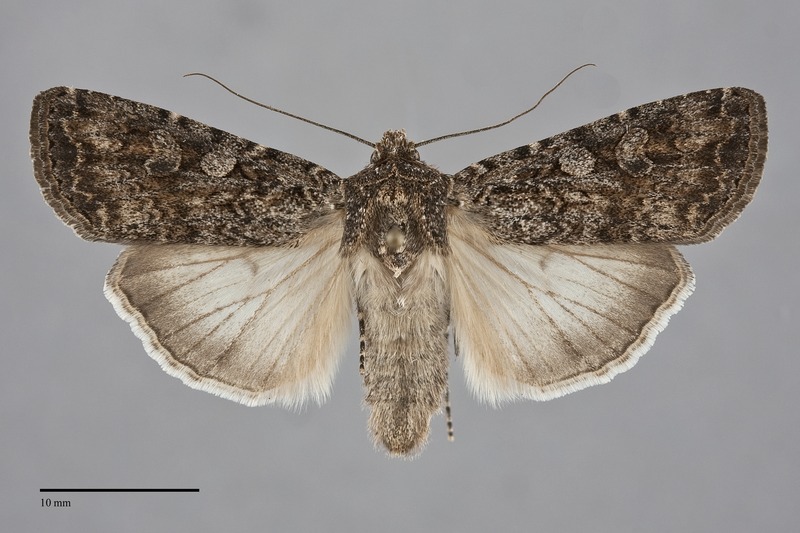 The posterior median and subterminal areas of E. pleuritica are less powdery copper-brown than those of E. simona, and the dark gray terminal area contrasts more with the rest of the wing. Euxoa simona resembles some forms of Euxoa auxiliaris, a very common and widespread large Euxoa in our area, but is more powdery and has broader forewings than this species. 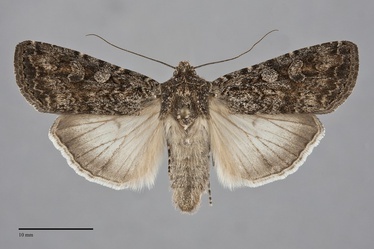 Euxoa septentrionalis, another common fall-flying moth, resembles E. simona. It is usually slightly smaller and much smoother gray-brown in color and has a rounder orbicular spot with a darker center than that of E. simona. The type locality of the synonym Euxoa pleuriticoides Benjamin is Crater Lake, Oregon. This species flies in a variety of habitats, including arid forest, rangeland, and near timberline in the mountains. In the Pacific Northwest, it is usually uncommon in coniferous forests at higher elevations in the Cascades and Rocky Mountain regions except on high dry ridges where it is more frequent. It is often abundant in lower elevation juniper woodlands and dry sagebrush steppe east of the Cascades, particularly during drought years. Its most favored habitat in Oregon is alkali flats with saltbrush (Atriplex spp.) that are wet during the spring, or moist sagebrush steppe adjacent to wetlands such as marshes or riparian zones. Massive epidemic outbreaks of this species sometimes occur in desert wetlands, particularly if heavy disturbance by domestic livestock is present. Euxoa simona is found throughout much of our region from the high Coast Range and Cascade Ranges east. The northern limit is in southern British Columbia. This species occurs in the mountains of southwestern Alberta east of the limits of the Pacific Northwest. The range extends south from our border and Alberta to southern Colorado and southwestern California through the Intermountain region. The adults have a fairly long flight period and have been found from late May to early September in our region. However, they are most commonly collected in late July and early August. It is likely that this species breeds at low elevations and migrates into the mountains during the summer as Euxoa auxiliaris is known to do.